Are you new to blockchain? You may have probably already heard about the amazing work that the Linux Foundation has done with Hyperledger Fabric. It’s a modular framework for building permissioned blockchain networks. I will use as a baseline the design from the Fabric-Sample repo FabCar, I won’t change its design, only migrate the code to Convector Framework. As the title mentions, I’ll be using the new Convector CLI with Hyperledger Fabric as the underlying blockchain technology. 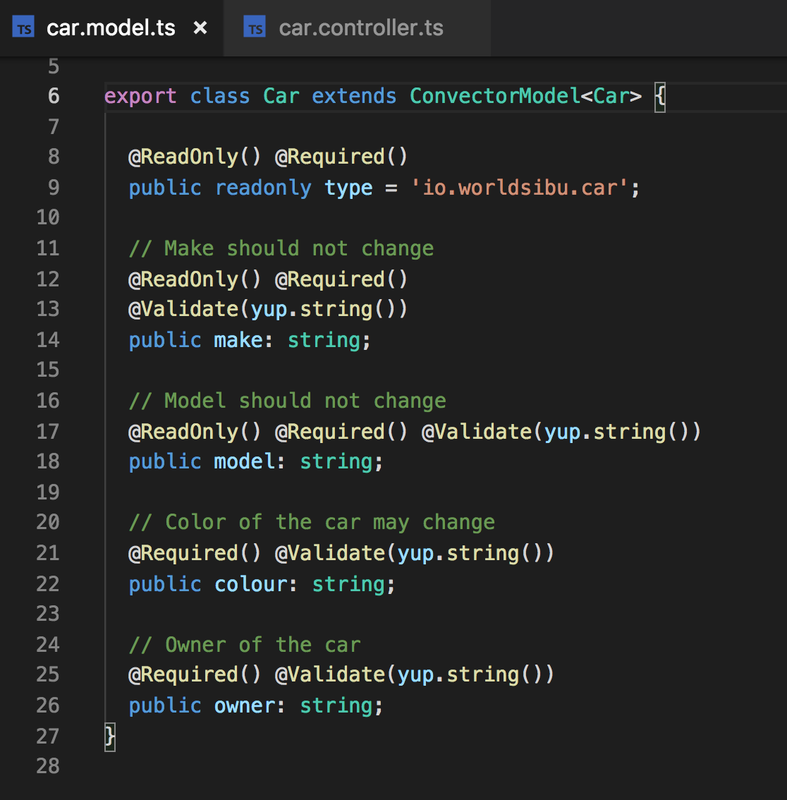 We will need to migrate the current structure from the fabcar.go to a car.model.ts TypeScript class. The first difference is that Convector helps you to structure your mind around Model/Controller pattern. So instead of having everything in a single file, Convector-CLI generates two files for you. One is a simple model with a few Decorators to make it easier for validations, as well a controller class in which you define your smart contract rules. The rest are supporting files. For example*.config.json are for installation in the blockchain purposes. It already comes in with all the details the network will need. 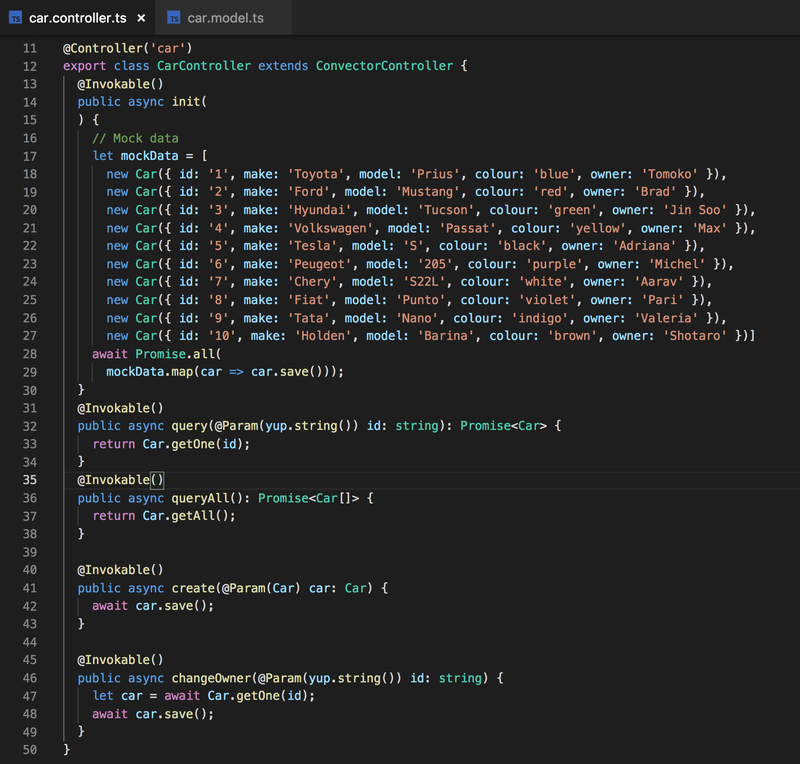 Convector recommends using Lerna for a multipackage project as well TypeScript (required for now). As you can see it’s a fairly simple structure. 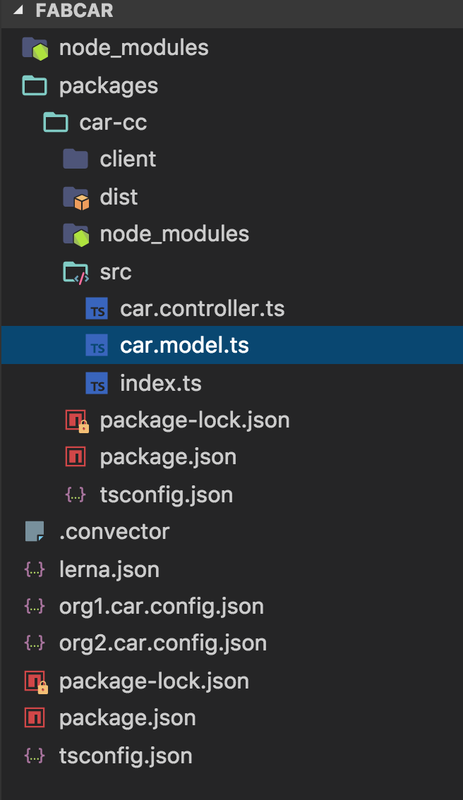 Open your Convector-CLI generated project’s folder and go to ./packages/car-cc/src/car.model.ts . As you can see it is still fairly simple yet it has a few @ Decorators. This will help you avoid validation mistakes since it takes away simple verifications out of your code, for example instead of doing if(!item.owner) throw new Error(‘owner cannot be null’); , you only write @Required() on top of the property. Cleaner TypeScript/Convector way of doing a controller with the typical functions. See how simple the code becomes? That’s the main goal of Convector. In less than 20 minutes you can have your smart contract developed. Obviously the code may look great, but let’s test it out! Convector-CLI creates a basic set of scripts to consume Convector Tools (in this case Development Environment manager — that installs you a blockchain network, and Chaincode Manager which helps you installing and upgrading chaincodes). # Now install the chaincode! That’s all! Now you have a running network (see details of what gets provisioned for you here Development Environment) and your own chaincode installed. The next step is to call it from your backend! Another great thing about Convector is that you can use the native Fabric tools, so from your programming language invoke your chaincode with the corresponding Fabric SDK. If you are using NodeJS the framework will provide you helpers to connect your backend server with your blockchain. More info about it here.